add it to the list is my twist on In My Mailbox, hosted by The Story Siren. why i added it to my list: i am THRILLED to have this copy from the publisher, as i totally adored Please Ignore Vera Dietz. King has a great writing style that's authentic and hilarious. her plots are unique and genuine. plus, y'all KNOW i love a male main character. let's do this! received a copy from my library! why i added it to my list: hello! mythology! male main characters! MYTHOLOGY. why i added it to my list: so i could finish the series! YAY! review coming this week. what did you add to your lists this week? hit me up and let me know! and then be sure to head over to The Story Siren and link it up over there. I loved the Percy Jackson series!! THE LIGHTENING THEIF! I love the whole damn series which I got for Christmas last year and read all of them in a week. Yeah, that good. Hope you LOVE it! Oh, and if you liked the movie the book will ruin it for you. I watched the movie and then read the book and the movie was never the same. I feel like such a fail whale this morning :( I haven't blogged since FRIDAY! 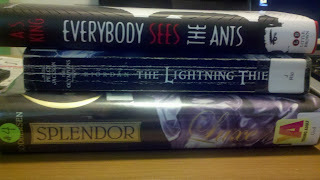 but.. since I'm on a book buying ban, I haven't exactly gotten anything noteworthy in the mail either. OH WAIT. Yes I have! Hmm.. maybe I'll type up a blog post real quick.. haha.. I loved Vera too! Let me know your thoughts on this one! Great books will have to check out Vera! Great books! I actually haven't read the Luxe series--I tried to, but couldn't get into the first book. 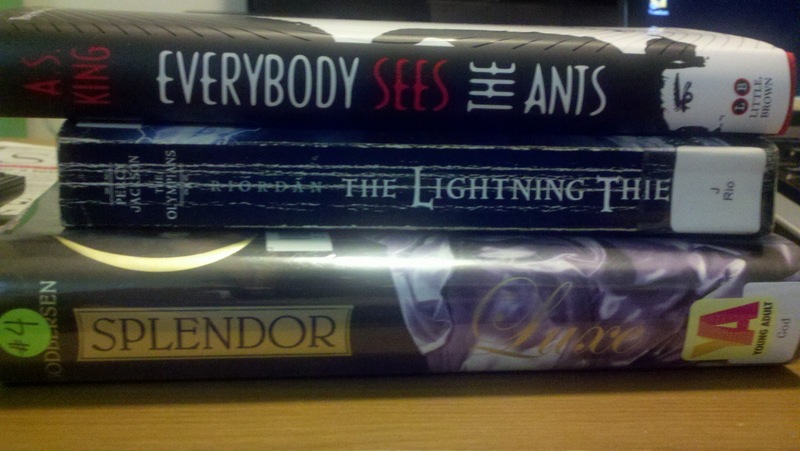 But then I fell in love with Bright Young Things, so eventually, I'm going to try the Luxe books again. I can't wait to hear what you think of Splendor. Happy reading! Ooh I really enjoyed the Percy Jackson series. You gotta get past the first few, though. <3 Percy. You and my sweet Greta must be on the same wavelength right now...she checked it out from the library on Friday as well. Jules and Victorie - i'm stoked to check this series out! Ginger - you could never, EVER, be a fail whale! Okay, please share your thoughts on the Luxe series. Do you love it forever? Should I read it immediately? And YAY for Everybody Sees the Ants! I really liked Vera Dietz, so I'm looking forward to this one as well.